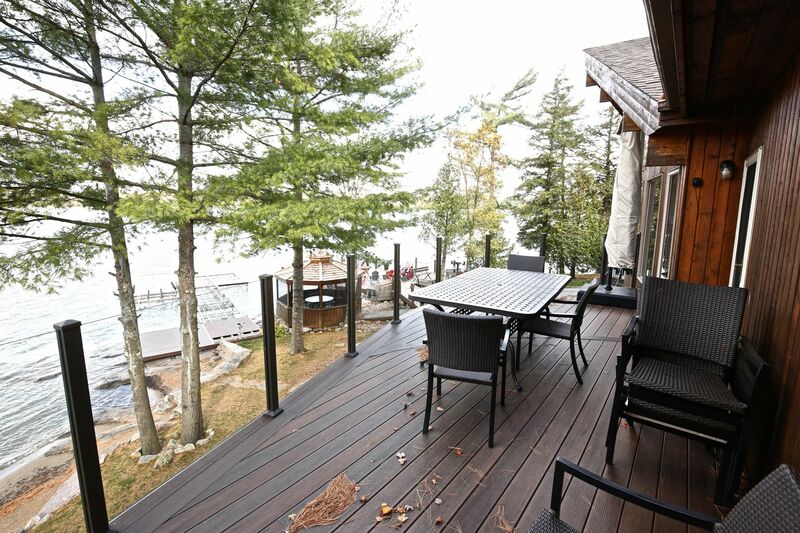 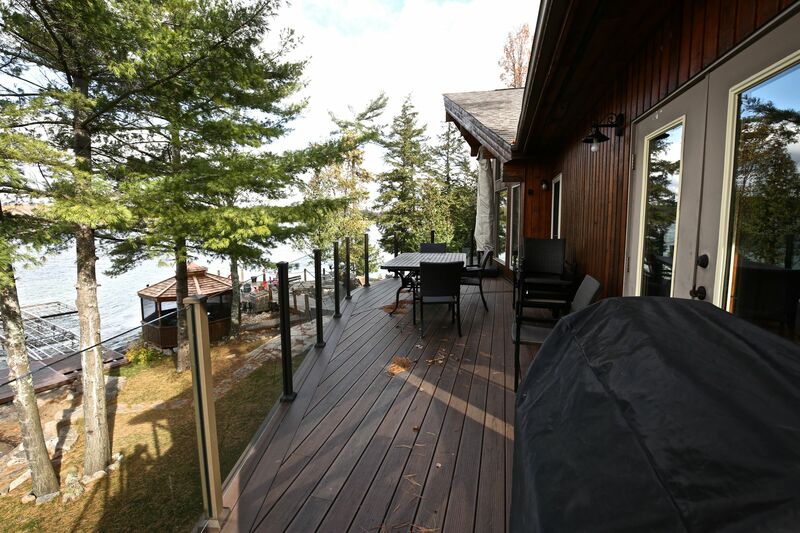 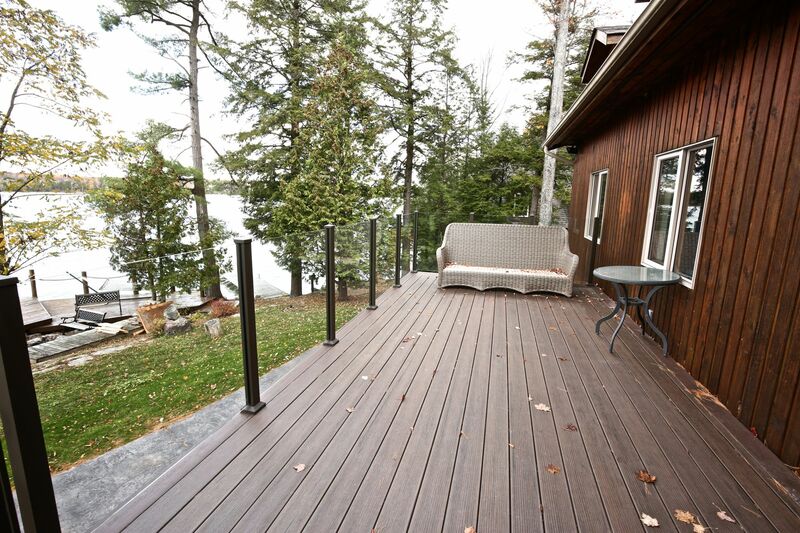 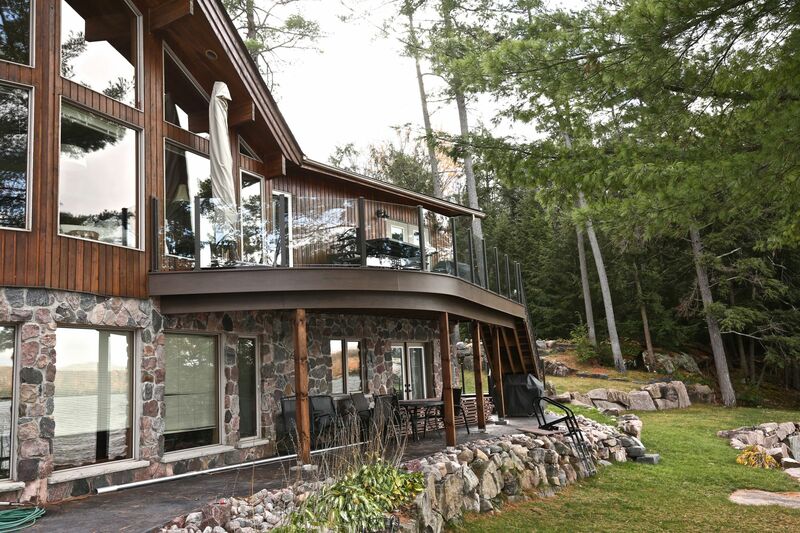 These distinctive Sandy Lake decks were designed to compliment one another. 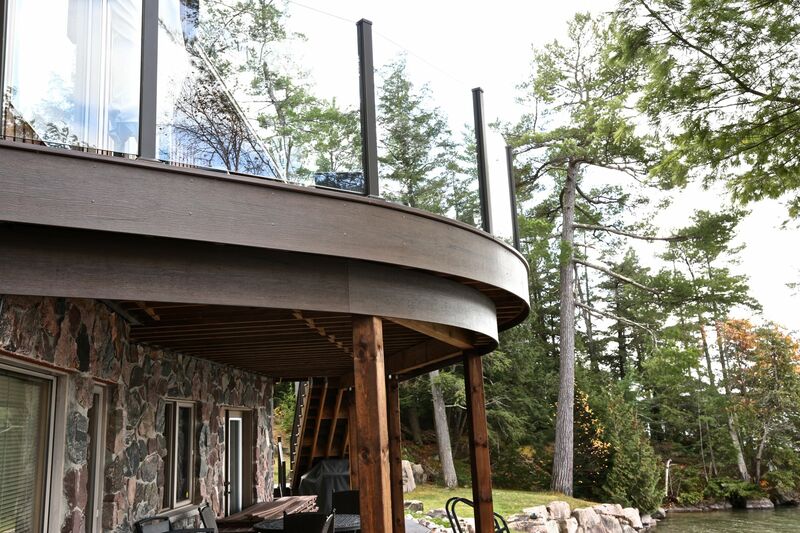 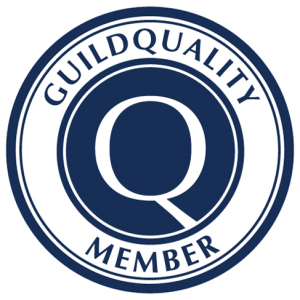 One is an angular, curving and sweeping deck. The other is more linear with an angular access and egress feature that resembles the theme of the existing cottage design. 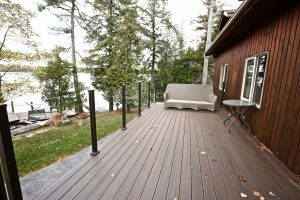 These decks were designed and constructed with two different intended uses. 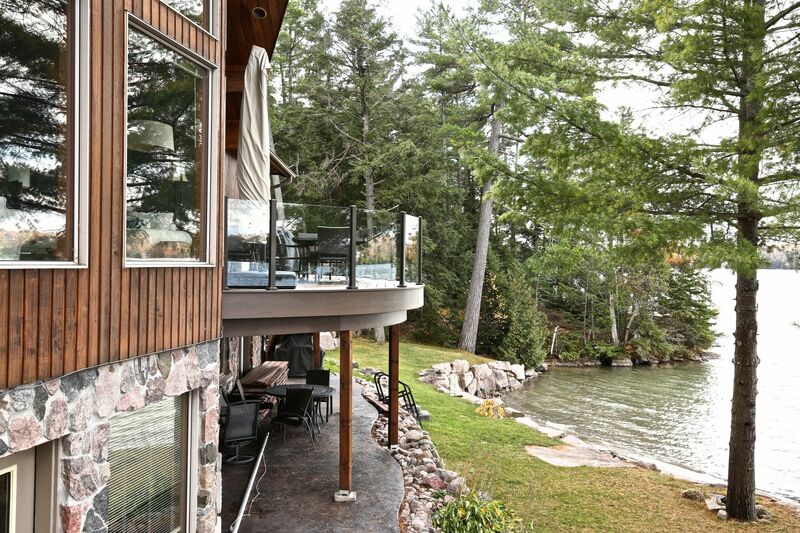 The lakeside dining deck was meant for casual dining with a great elevated view. The lake vue deck was designed to provide space for entertaining and relaxation (and of course, with a great view of the lake!). Both decks needed to provide stairs to grade allowing direct access to the existing traveled walkways that leads to the lake. 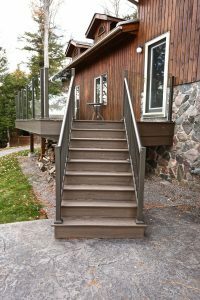 The decks both faced a design challenge. 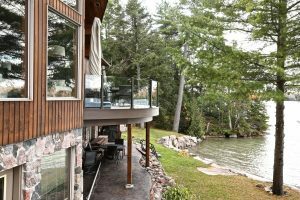 They were limited in size or rather overall depth and projection towards the high water limit as determined by municipal regulations. This meant that furniture arrangement and positioning became key to the final design knowing the dimensional limitation. The angular design of the lakeside dining deck mirrors the shoreline maintaining the maximum projection permitted in this direction while the lake vue dining deck was designed to maintain the front line projection of the original deck. 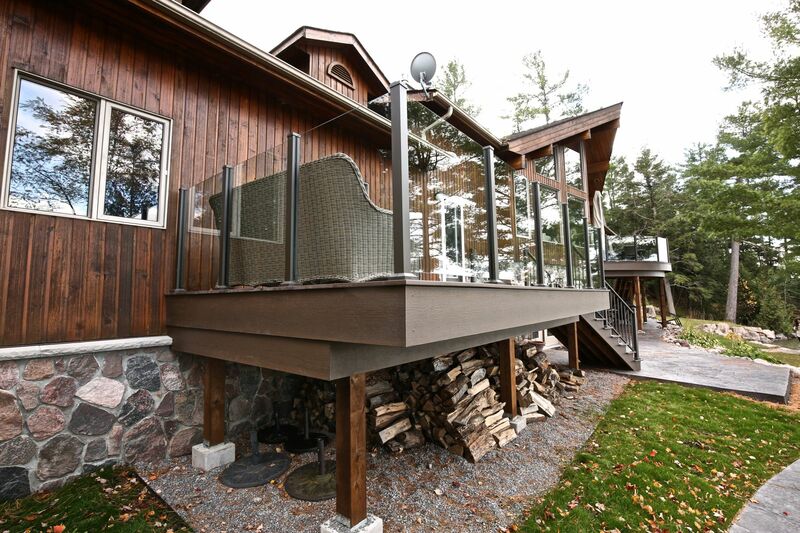 Both decks are constructed with contemporary construction elements in keeping with the modern designs. 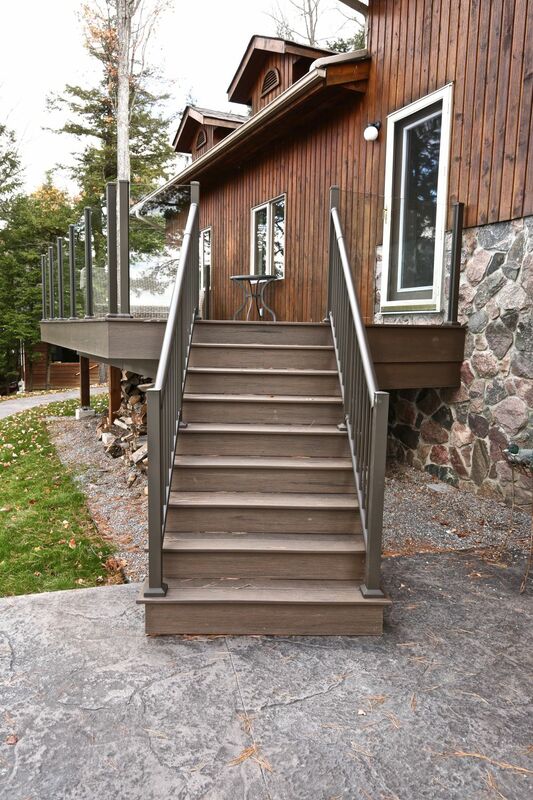 Both wood-fibre and PVC composite decking was used throughout including stairs, beam & rim fascia, and stair stringer cladding. 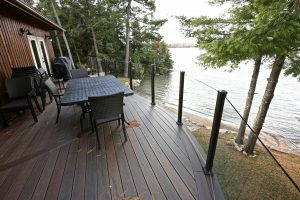 The lakeside dining deck features a sweeping curved PVC composite inlay which provides a bit of drama as well ensuring that the decking does not exceed the 20 foot long recommended maximum length. 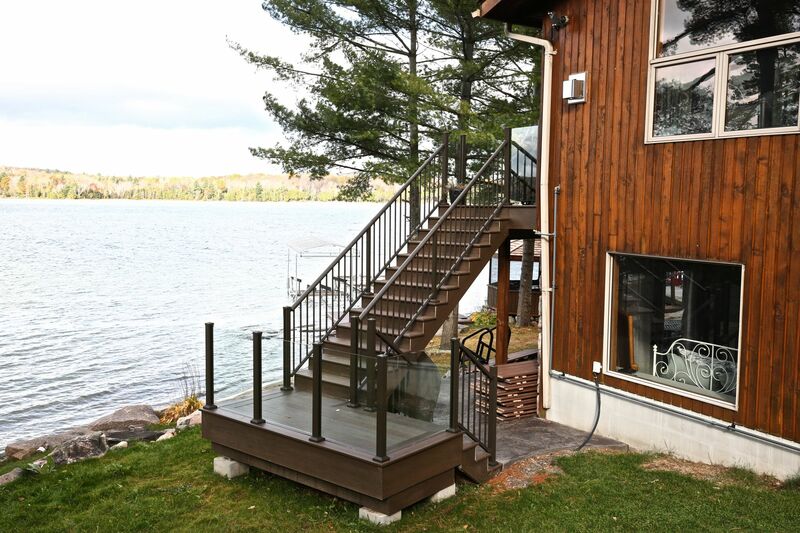 Both decks feature the same contemporary railings systems constructed with frameless aluminum and glass panels. 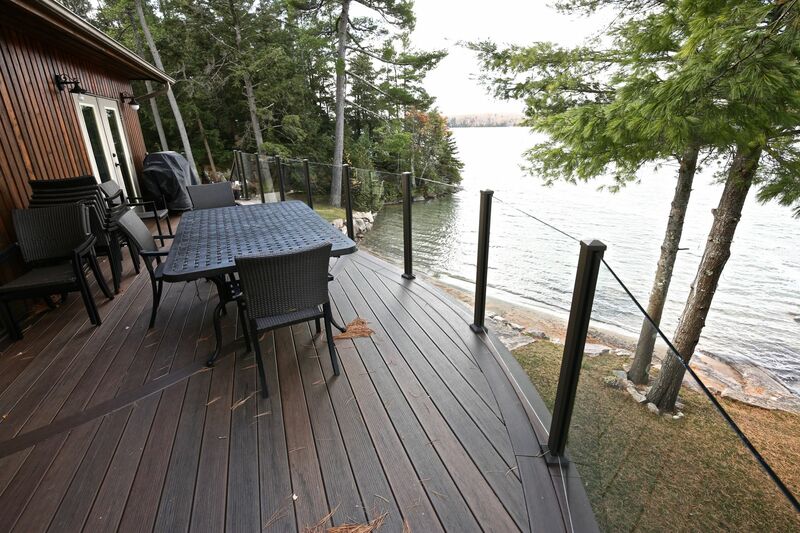 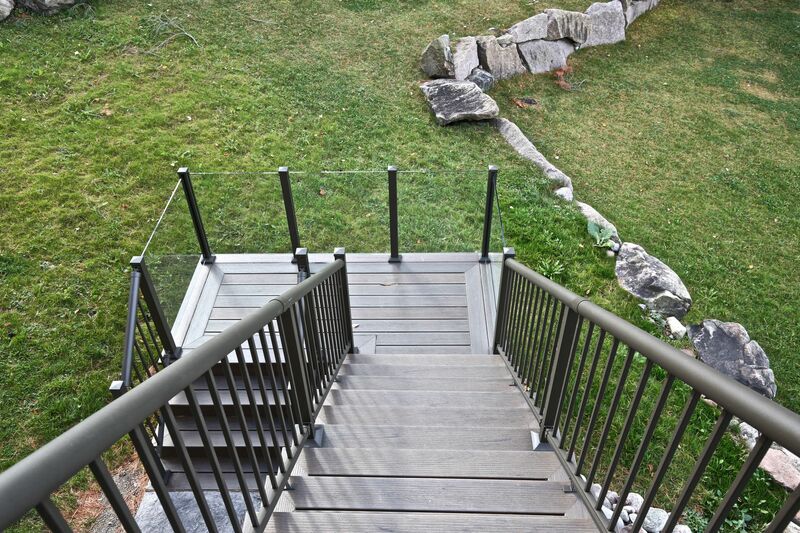 These railings offer unobstructed viewing of the lake and surrounding landscape features as there is no top or bottom rails. 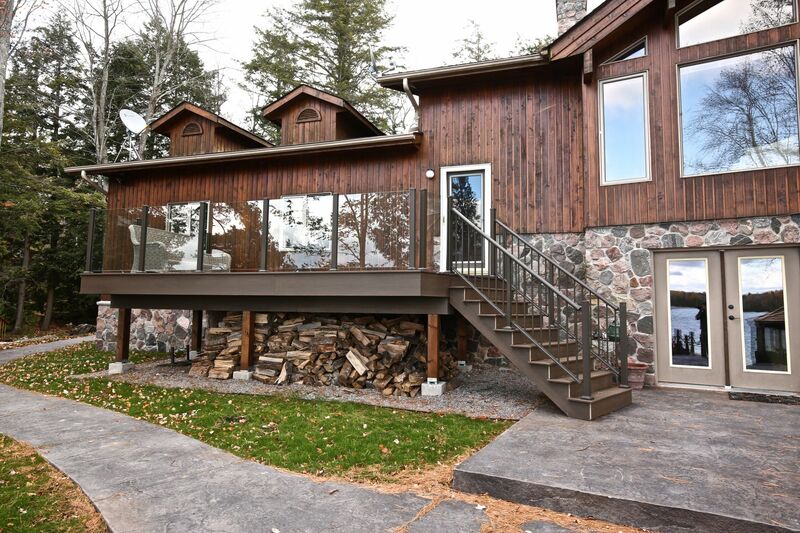 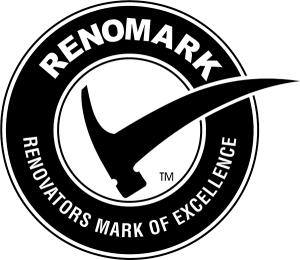 The final resulting product which comes from working with our client’s wish list and adapting to and around the challenges which arose is a dramatic pair of decks which function well, look great and blend with the existing cottage.